Aim: The aim of this study is to evaluate the smear layer removal efficiency of Max-I-Probe, EndoActivator, and EndoVac at three different levels in the apical portion of curved root canals. Materials and Methods: Mandibular molars with angles of root curvature between 25 and 40 degrees were selected and divided into three groups. The specimens were instrumented to size 35/0.04. Group 1 received conventional irrigation with Max-I-Probe needle; Group 2 and Group 3 were irrigated with EndoActivator and EndoVac, respectively. Following shaping and cleaning, the roots were observed under scanning electron microscope for smear layer at three levels (1 mm, 3 mm, and 5 mm from working length). One-way analysis of variance was calculated and to find the exact significance among the groups a post hoc test, i.e., Bonferroni test was performed. Results: The level of significance was set as P < 0.05. The EndoVac system resulted in a significantly better smear layer removal than the Max-I-Probe needle at all levels. The EndoVac also demonstrated enhanced smear layer removal than the EndoActivator at 3 mm and 1 mm levels. Conclusions: The application of EndoVac system could enhance smear layer removal at the apical portion of curved canals. Endodontic microbial biofilm has been reported as the primary cause of the development of apical periodontitis. Even though mechanical instrumentation results in a drastic reduction in the microbial load, a proportionally significant canal surface may remain untouched by cleaning instruments. Debridement with antibacterial irrigants is essential to enhance canal disinfection. Endodontic irrigation aims to remove pulp tissue, microorganisms and their byproducts, as well as debris and smear layer formed after mechanical instrumentation from the root canal system. Till date, no study has compared the debridement efficiency of the conventional irrigation with a side-ported needle: Max-I-Probe, EndoActivator, and EndoVac in curved root canals. Hence, the aim of this study was to compare the efficiency these three different irrigation devices for smear layer removal in curved root canals at three different levels (1 mm, 3 mm, and 5 mm from working length [WL]). Sixty freshly extracted mandibular molars with at least one curved root and root canal were selected. Only teeth with intact apical portion and an apical width approximately compatible with ISO 15K-file were used. Teeth with an angle of curvature between 25° and 40° and with radii of curvature between 4.0 mm and 9.0 mm as described by Schäfer et al. were included. The teeth were randomly divided into three groups of 20 teeth each based on the irrigation technique. Only one curved canal was instrumented in each tooth. The occlusal surface was made flat to standardize the reference point. Access cavity was prepared using a 014 round carbide bur and Endo Z burs (Dentsply International, York, PA, USA) and the WL was determined by subtracting 1 mm from the length of the K-file at apical foramen. Following WL determination, the apical foramens were sealed using Triad Gel (Dentsply Tulsa Dental). The teeth were then embedded in 1-inch segments of surgical tubing filled with polyvinyl siloxane impression material (Dentsply Caulk) till cementoenamel junction. The canals were prepared with rotary MTwo file (VDW, Munich, Germany) in a gentle in and out motion following manufacturer recommendations till size 35/0.4. The irrigation regimen in each group was as follows. Following access preparation, 3 ml of 2.5% NaOCl was delivered using Max-I-Probe needle (Dentsply Rinn, Elgin, IL) adapted on a disposable plastic syringe to debride the pulp chamber for 30 s. Following the use of each file, the canal was irrigated with 3 ml of 2.5% NaOCl. The needle tip was placed just short of the binding point but no closer than 2 mm from the WL. The NaOCl solution was left undisturbed for 60 s after the last used file. Final irrigation was performed in the following sequence. The canal was rinsed with 5 ml of 17% EDTA followed by 5 ml of 2.5% NaOCl. The irrigant was aspirated using the Max-I-Probe needle at 2 mm from the WL. The initial irrigation was carried out similar to that of Group 1. During final irrigation, the canal was rinsed with 5 ml of EDTA followed by irrigant activation using the blue tip; #35/0.04 of EndoActivator (Dentsply Tulsa Dental, Tulsa, OK) placed up to 2 mm from WL operated at 10,000cpm for 60 s. Finally, the canal was rinsed with 5 ml of 2.5% NaOCl and activated with EndoActivator blue tip for 30 s similar to EDTA activation. The protocol for the usage of EndoActivator is as proposed by Ruddle. Irrigant was then aspirated from the canal in the same way as done in Group 1. A total of 30 ml of irrigant was used per canal in both Group 1 and 2. Before canal instrumentation, 5 ml of 2.5% NaOCl was delivered by placing the EndoVac (Discus Dental, Culver City, CA) master delivery tip above the access opening. Following each instrument, the canal was irrigated with 5 ml of 2.5% NaOCl using master delivery tip. After the last instrument was used, macro-irrigation was performed for 30 s with 5 ml of 2.5% NaOCl using macrocannula. While the master delivery tip was delivering the irrigant, the macrocannula was constantly moved up and down in the canal from the point it just started to bind to a point just below the orifice. The irrigant was then left undisturbed in the canal for 60 s. Finally, “micro-irrigation” was performed in three sequential cycles. During micro-irrigation, as the pulp chamber was kept full of irrigant by the constant delivery of irrigant using the master delivery tip, the microcannula was taken to the WL for 6 s. The microcannula was then placed 2 mm short of the WL for 6 s and then carried back to WL for 6 s. This vertical movement was performed for 30 s ensuring active 18 s of micro-irrigation at the WL. After 30 s of micro-irrigation, the microcannula was withdrawn from the canal in the presence of adequate volume of irrigant in the pulp chamber to ensure that the entire canal was filled with irrigant without any air entrapment. The irrigant was then left undisturbed in the canal for 60 s. This constituted one micro-irrigation cycle. The first cycle used 5 ml of 2.5% NaOCl as the irrigant, the second cycle used 5 ml of 17% EDTA, and the third cycle used 5 ml of 2.5% NaOCl. Following micro-irrigation, the microcannula was taken to the WL without replenishment to aspirate irrigant from the canal. The EndoVac protocol used in this study was similar to the one used by Nielsen and Baumgartner. A total of 55 ml of irrigant was used per canal in this group. The specimens were decoronated and the prepared root was split into two halves using a diamond disc and chisel. Mtwo 35/0.4 gutta-percha points were placed in the canals before sectioning to avoid intrusion of the cutting disc into the canal, which may pollute the canal with cutting debris. For each root, the half containing the most visible part of the root canal wall was selected and coded. The samples were then dehydrated in graded series of ethanol solution, dried to critical point, gold coated, and viewed under scanning electron microscope (SUPRA 35; Carl Zeiss SMT, Oberkochen, Germany). Three micrographs were taken per coded sample at 1 mm, 3 mm, and 5 mm from the WL at 1500x magnification. The smear layer scoring was assigned by a blinded assessor following the scale developed by Hulsmann et al. [Table 1]. A five-level scoring system was employed for assessing the efficacy of smear layer removal. Representative images of different groups are shown in [Figure 1]. Measures of central tendency (mean) and measures of dispersion (standard deviation) were calculated. To compare the mean difference among the three groups, analysis of variance was calculated. A post hoc test, i.e., Bonferroni test was performed to find the exact significance among the three groups. 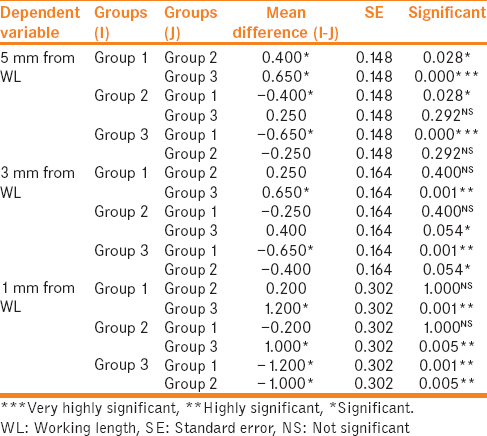 The results for the various groups are reported in [Table 2] as the mean score and standard deviation. The comparison of smear layer score among the three groups is tabulated in [Table 3]. P value of <0.05 was considered significant. In all the groups, the highest mean smear layer score was found at 1 mm level followed by 3 mm and 5 mm levels. At 5 mm level, Group 1 showed significantly less smear layer removal when compared to the other two groups. Group 3 recorded less mean smear layer score than Group 2, but the difference was not statistically significant. At the 3 mm level, Group 3 resulted in the cleanest canal with significantly more smear layer removal than the other two groups. Group 2 recorded less mean smear layer score than Group 1, but the difference was not statistically significant. At the 1 mm level, Group 3 recorded less mean smear layer score than the other two groups. In all the groups, the 5 mm level showed the lowest mean, whereas the 3 mm level had a higher mean and the 1 mm level showed the highest mean smear score. Mechanical instrumentation of the root canal results in smear layer formation. Smear layer consists of dentin particles, pulp tissue remnants, bacteria, and their byproducts. It has been shown that bacteria may survive and multiply in the smear layer, thereby posing a threat to the long-term success of root canal treatment. Smear layer may act as a substrate for bacteria and may allow their deeper penetration into dentinal tubules., It may also interfere with the formation of a satisfactory seal by acting as a barrier film between the canal wall and the obturating material. Effective tubular penetration of the disinfectants may also be compromised in the presence of smear layer., For the aforementioned reasons, smear layer removal has become an integral part of endodontic therapy. Teeth with curved root canals were used to evaluate the performance of the irrigation devices in the presence of root curvature. To ensure the availability of a reservoir of irrigant during irrigation, the crowns were not decoronated during canal preparation. The apical foramen were sealed with triad gel to simulate in vivo condition (a closed canal system), thereby causing gas entrapment in the root canal and preventing the escape of irrigants through the apex., Sodium hypochlorite and EDTA were used in an alternative manner in this study as it is recommended for the efficient removal of the smear layer. The MTwo file system was used as it has been shown to maintain the original canal curvature. Since the replacement of irrigant is limited to 1–1.5 mm beyond the needle tip.,,, The apical segment has to be prepared to at least size 35–40 for needle placement to within 1–2 mm of the WL., Preparation of size 35/.04 at the WL is also essential for the effective usage of EndoVac microcannula at the WL. The EndoVac group displayed significantly better smear layer removal at all the levels tested when compared with Max-I-Probe. This finding is in line with that of Ahuja et al. who found superior efficiency of EndoVac over needle irrigation at coronal, middle, and apical portion of curved root canals. Several studies have shown the superior debridement efficiency of the EndoVac system when compared to needle irrigation at 1 mm from the WL., However, at 3 mm level, these studies have found no significant difference between EndoVac and needle irrigation. The probable reason for such divergence in the result at 3 mm level could be that these studies have used straight root canals, whereas, in the present study, curved root canals were used. The enhanced smear layer removal of EndoVac could be attributed to its ability to draw irrigant up to the WL by means of the negative pressure that it generates within the canal.,, In a study to compare the debridement efficiency in open and closed canal system using EndoVac and manual irrigation, Parente et al. found the apical negative pressure irrigation to be able to overcome the fluid dynamic challenges inherent to closed canal systems. The superior performance of the EndoVac could be attributed to the robust bubble formation when the irrigant is delivered since the rate of aspiration of the irrigant is more than that of the rate at which irrigant is delivered using syringe and needle. It was also observed that, at the 5 mm level, there was no significant difference between the EndoActivator and the EndoVac. However, at the 3 mm and 1 mm level, the EndoActivator group also demonstrated significantly inferior smear layer removal than the EndoVac group. This could be partially explained by the findings of Jiang et al. who found a lot of contact of the EndoActivator tip with the dentinal walls, thereby inhibiting the free oscillation of the tip required to generate efficient irrigant streaming and cavitations' effect. The findings of this study are also in line with that of Rodig et al. in which the EndoActivator system has shown a less effective smear layer removal in the curved apical portion than the straight coronal portion of curved canals. Uroz-Torres et al. have concluded in their study that the EndoActivator system did not enhance the removal of smear layer as compared with conventional Max-I-Probe irrigation, a finding similar to the results of this study. In a study, which compared the effectiveness of EndoActivator with conventional needle irrigation in terms of calcium hydroxide removal, EndoActivator was found not to improve the calcium hydroxide removal in the middle and apical thirds. Caron et al. have found better smear layer removal with the EndoActivator system than conventional needle irrigation. This is partially in contrast to the results of the present study except at 5 mm level. The difference in results could be attributed to the methodological protocols followed. The study by Caron et al. utilized 27-gauge needles to deliver the irrigant. The apical preparation had a dimension of diameter in the range of 0.20 mm and 0.30 mm with a 10% taper, whereas the present study utilized a 30-gauge needle and the canals were prepared to an apical dimension of 0.35 mm diameter and 4% taper. At the 5 mm level, which represents the relatively straight portion of curved canals, the EndoActivator system displayed a superior smear layer removal, which is in line with the findings of Caron et al. However, at the 3 mm and 1 mm level, which represents the highly curved apical portion of curved canals, there was no significant difference between the EndoActivator and needle irrigation for smear layer removal. Within the conditions of the present study, it can be concluded that none of the irrigation devices were able to remove the smear layer completely at the various levels tested (1 mm, 3 mm and 5 mm from the WL). However, the EndoVac system demonstrated a superior smear layer removal than conventional needle irrigation at all the levels tested. The EndoVac also was found to be better than the EndoActivator system in smear layer removal at the 1 mm and 3 mm levels, which represent the canal region with greater degree of curvature. Haapasalo M, Shen Y, Wang Z, Gao Y. Irrigation in endodontics. Br Dent J 2014;216:299-303. Chow TW. Mechanical effectiveness of root canal irrigation. J Endod 1983;9:475-9. Sedgley CM, Nagel AC, Hall D, Applegate B. Influence of irrigant needle depth in removing bioluminescent bacteria inoculated into instrumented root canals using real-time imaging in vitro. Int Endod J 2005;38:97-104. 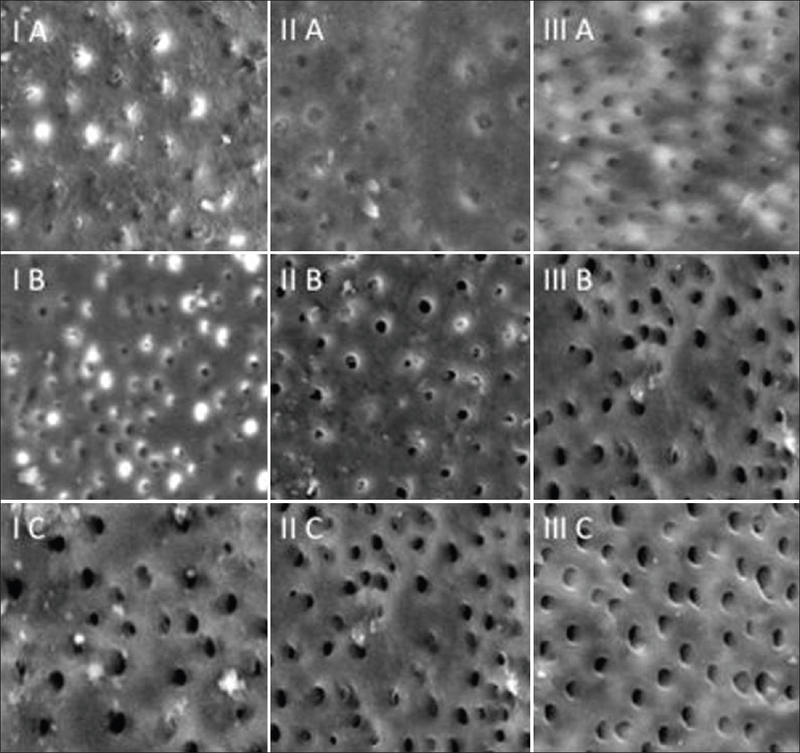 Vera J, Arias A, Romero M. Dynamic movement of intracanal gas bubbles during cleaning and shaping procedures: The effect of maintaining apical patency on their presence in the middle and cervical thirds of human root canals – An in vivo study. J Endod 2012;38:200-3. Tay FR, Gu LS, Schoeffel GJ, Wimmer C, Susin L, Zhang K, et al. Effect of vapor lock on root canal debridement by using a side-vented needle for positive-pressure irrigant delivery. J Endod 2010;36:745-50. Ruddle CJ. Endodontic disinfection: Tsunami irrigation. Saudi Endod J 2015;5:1-12.
de Gregorio C, Estevez R, Cisneros R, Heilborn C, Cohenca N. Effect of EDTA, sonic, and ultrasonic activation on the penetration of sodium hypochlorite into simulated lateral canals: An in vitro study. J Endod 2009;35:891-5. Schoeffel GJ. The EndoVac method of endodontic irrigation, part 2 – Efficacy. Dent Today 2008;27:82, 84, 86-7. Nielsen BA, Craig Baumgartner J. Comparison of the EndoVac system to needle irrigation of root canals. J Endod 2007;33:611-5. Schäfer E, Diez C, Hoppe W, Tepel J. Roentgenographic investigation of frequency and degree of canal curvatures in human permanent teeth. J Endod 2002;28:211-6. Susin L, Liu Y, Yoon JC, Parente JM, Loushine RJ, Ricucci D, et al. Canal and isthmus debridement efficacies of two irrigant agitation techniques in a closed system. Int Endod J 2010;43:1077-90. Boutsioukis C, Lambrianidis T, Kastrinakis E. Irrigant flow within a prepared root canal using various flow rates: A Computational fluid dynamics study. Int Endod J 2009;42:144-55. Gao Y, Haapasalo M, Shen Y, Wu H, Li B, Ruse ND, et al. Development and validation of a three-dimensional computational fluid dynamics model of root canal irrigation. J Endod 2009;35:1282-7. Huang TY, Gulabivala K, Ng YL. A bio-molecular film ex-vivo model to evaluate the influence of canal dimensions and irrigation variables on the efficacy of irrigation. Int Endod J 2008;41:60-71. Ahuja P, Nandini S, Ballal S, Velmurugan N. Effectiveness of four different final irrigation activation techniques on smear layer removal in curved root canals: A scanning electron microscopy study. J Dent (Tehran) 2014;11:1-9. Parente JM, Loushine RJ, Susin L, Gu L, Looney SW, Weller RN, et al. Root canal debridement using manual dynamic agitation or the EndoVac for final irrigation in a closed system and an open system. Int Endod J 2010;43:1001-12. Goode N, Khan S, Eid AA, Niu LN, Gosier J, Susin LF, et al. Wall shear stress effects of different endodontic irrigation techniques and systems. J Dent 2013;41:636-41. Rödig T, Döllmann S, Konietschke F, Drebenstedt S, Hülsmann M. Effectiveness of different irrigant agitation techniques on debris and smear layer removal in curved root canals: A scanning electron microscopy study. J Endod 2010;36:1983-7. Uroz-Torres D, González-Rodríguez MP, Ferrer-Luque CM. Effectiveness of the EndoActivator system in removing the smear layer after root canal instrumentation. J Endod 2010;36:308-11. Al-Garni S, Al-Sharani S, Al-Nazhan S, Al-Maflehi N. Evaluation of calcium hydroxide removal using EndoActivator system: An in vitro study. Saudi Endod J 2014;4:13-7. Caron G, Nham K, Bronnec F, Machtou P. Effectiveness of different final irrigant activation protocols on smear layer removal in curved canals. J Endod 2010;36:1361-6.